A good compost is one of the best things in the garden. We are in the process of emptying our beds for winter and were inspired to spend Saturday building a spectacular compost bin. It has removable boards in the front for easy turning and removal of processed loam. It looks quite presentable tucked in under the pear tree (soon to be espaliered). I took great pleasure in delivering our juicing scraps to it this morning. Come next spring we hope to harvest a whole bundle of goodness from it. 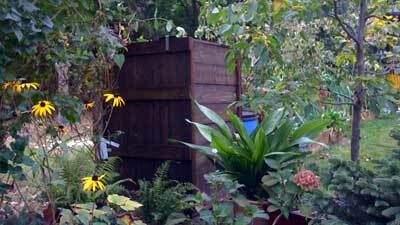 This entry was posted in Garden and tagged compost, eco build, garden, seasons, tree. Bookmark the permalink.